It’s brag time. My DMs Guild products are doing well. Right now I have one Silver Best Seller, 15 New Backgrounds, and three Copper Best Sellers, 20 New Traps, 50 New Magic Items, and Catastrophic Dragons. 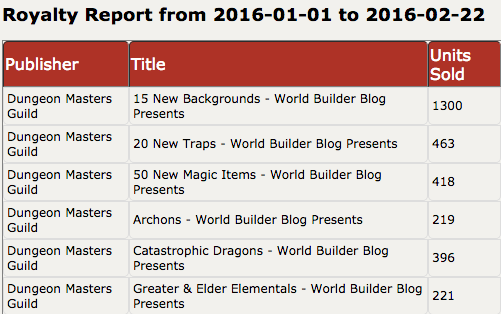 Thanks to everyone who has downloaded these products and my others, Archons and Greater & Elder Elementals! If you’ve downloaded any of these products please leave me some feedback in the form of a review or discussion. Even just giving a product the number of stars you think it deserves without leaving a long review is very helpful. How Good is a Best Seller? Some of you are probably wondering, what does it even mean to be a Copper or Silver best seller? 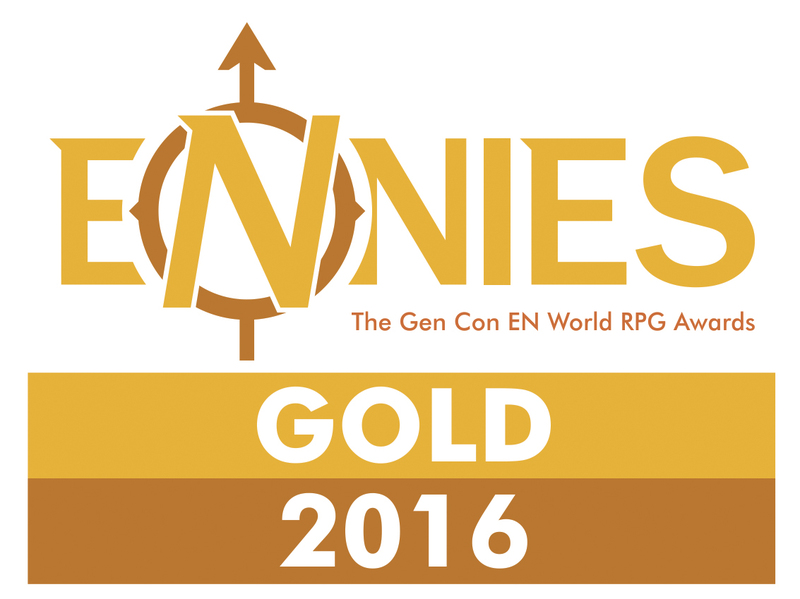 Well, I can tell you that the DMs Guild has five levels of best seller – Copper, Silver, Electrum, Gold, and Platinum. No exact numbers are given for the required sales to reach each best seller level. I am not sure why. It may be as the DMs Guild becomes more (or less) popular those numbers change because OneBookShelf wants to always have some best sellers on the list, but not so many that every single PDF becomes one so the name has no meaning. I have no proof that’s what is happening. I’m just throwing an idea out there that makes sense to my marketing brain. UPDATE: After speaking with the amazing David Gibson, he said he believes that the best seller medals come from paid download numbers only. He has a lot of awesome products on the DMs Guild and RPGNow for cheap. They’re wonderful. Check them out. He thinks Copper is around 50 sales, Silver is around 100, Electrum is 250, Gold is 500, and Platinum is 1000. If I make it to any of those numbers, I’ll let ya know! I know that somewhere around 370 downloads 15 New Backgrounds, 20 New Traps, 50 New Magic Items, and Catastrophic Dragons became Copper. Somewhere around 740 downloads 15 New Backgrounds became Silver. If 15 New Backgrounds makes it to Electrum, I’ll let you know what it took. At the time of writing this post, that PDF has 1300 downloads and there are 46 Copper, 49 Silver, 17 Electrum, 2 Gold, and 2 Platinum total best sellers on the DMs Guild. 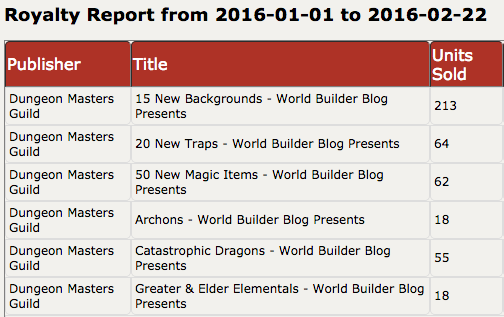 In addition 15 New Backgrounds has been on the top 20 of the DMs Guild list since it launched on January 22, hovering mostly around the number 15 spot. I think most people would call my work on the DMs Guild a success even if the numbers are pretty modest. I imagine one reason my products are doing well and climbing the charts is that they can be downloaded for free. In fact I know it. Look at the total numbers of downloads all my products have had. These numbers include free downloads. Now here’s the list with all the free downloads taken away. So you can see a big difference. In the case of 15 New Backgrounds over 1000 people have downloaded this sucker for free. I can’t even get them to leave a review. This probably isn’t a surprise to most of you. So why have I offered these products as Pay What You Want PDFs? A lot of folks might say I’m not valuing my work. I assure you that’s not it. Each product has hours of writing, design, editing, and layout associated with it which I’ve done myself. I would love to earn a little scratch from these beyond what I’ve made, which is less than $300 total. So all of that said why would I put out all of these products as Pay What You Want? I’m keeping a promise. The DMs Guild and Open Gaming License are young, only a bit older than a month. I’ve been creating content on this blog for two years. All of the content I am offering on the DMs Guild, with the exception of Greater & Elder Elementals, were available as free PDFs on this website, some for more than a year. Why were they free? There was no OGL at the time and I wanted to make fifth edition Dungeons and Dragons content. I had no credits to my name. I needed feedback on my work from a large community and without the safety net of the OGL I wasn’t sure I could charge for something without a cease and desist. I had no idea how it all worked and no idea if my stuff was any good. I put it out there for free, listened to feedback, and promised readers of this blog that the content in the PDFs available on the Free Game Resources section of this site would always be available for free… even if I moved it somewhere else. The DMs Guild’s terms of service do not allow me to keep the crappier, less laid out, less edited, un-arted versions of the content on this site for free and better PDFs on the DMs Guild that I can charge for, so I decided Pay What You Want was the way to go. I’m trying to get noticed! You might read the above point and think, “So why post anything on the DMs Guild at all?” I won’t lie. It’d be a dream come true to do some design work with Wizards of the Coast. After it launched the D&D team made it clear when the DMs Guild launched that it was now THE way to get their attention. I wanted to get products on there quickly while the competition was light. There was a whole supply of my own design work on this site that wasn’t part of the upcoming Exploration Age Campaign Guide I could use. Again, I wanted to keep my promise to readers so I made it free. The combination of wanting to get noticed and keeping my promise to you readers really drove the decision to put products on the DMs Guild and make them available as Pay What You Want. My layout skills are whack. I have put a lot of time into these PDFs, but if I’m being honest the layout and public domain art do make them feel a little amateur. I’m not skilled in these areas and since I knew I wanted the products to remain free, I kept it free for me to produce rather than hiring an artist and a print designer to do the layout. I’d never make the money back if I hired them. As for the future, not all my DMs Guild releases will be Pay What You Want. Anything already created for this blog which I decide to release on their site will be available as Pay What You Want for the reasons above. If I make something totally new and put it up there, I’ll probably charge for it. Looking at the modest sales numbers, the 50% profit share, and the fact that any DMs Guild product is limited to being sold only on that site, I’m not sure how many products I’ll be posting there in the future, but at least a few more may make their way there… especially if I can eventually put Eberron material up there! Don’t get me wrong, the DMs Guild is a great thing, but it’s not right for what I want to move forward with. As many of you know from a previous blog post, I’m moving forward with my own world of Exploration Age. After that, I’d love to tackle making Enora the Bound Sky a reality. I’ve been spending so much time blogging and podcasting that it helped me get some other RPG design jobs to which I want to dedicate time. More information on those as they develop! I also want to dedicate time to putting out the Exploration Age Campaign Guide and making it the best it can be. I can only do so much in a week, but never fear. This blog will continue to update regularly, though less frequently than it did. Thank you all so much for reading over the years. Let’s keep making awesome stuff together. You rock. « Round Table 107 – Winter Fantasy	» Now Is The Time For Heroes! Your work is always top-notch, James. The biggest issue with the DMs Guild is that there’s no quality control, so you don’t know if a random PDF that seems to have what you want will have GOOD content describing what you want. But with yours, I always know I’m getting quality stuff. I have a small list of authors on the DMs Guild that I trust to get me good content, and you’re at the top of that list. And I always pay something for your DMs Guild stuff, because you ought to get paid for all you do, between this and the Roundtable and everything else. I hear ya, but isn’t that true of many online RPG stores? The same could be said of RPGNow/DriveThru. Thank you for the kind words!!!! When are we seeing some Joe Lastowski products on the DMs Guild?! First, thank you for what you do. Game designing is not easy and it does take time. Secondly, I like the pay what you want format in this and other sites but I always have a hard time paying “X” before I read it. If it’s a set price and it sounds good I’ll pay the 2 or 3 dollars to get it. I think as a designer/blogger you have to set limits on pages and hours spent for said PDF. If the Pay what you want had a “or suggested value” button it may help others decide to pay more for that which you deserve. Hey thanks for reading and your support and comments! The DMs Guild does allow a consumer to see the author’s suggested price for a PWYW product (though it isn’t a button, which is a great idea). The site also allows you to purchase a PWYW item for free and then go back and pay for the product after reading it. Maybe more people aren’t aware they can do this? I was not aware as I have not yet bought anything off of that site that is PWYW yet. I have only bought priced materials. Thanks for that info. Thanks for the transparency. I have 8 titles on there right now (1 is PWYW with 134 free downloads), and I’ve sold a combined 180 units. Two are close to hitting 50 and I’m anxious to see if the Copper Seller badge will show up. If you would ever want to compare notes, drop me a line. Sometimes I feel like a tiny island in a sea of products and I think cooperation could so us all some good. What are your products Mark? Link them here! Interesting read – it’s always valuable to get some real world facts into a discussion. Pricing work is always the hardest decision to make! I wish you continued success. As a college student DM, I appreciate the free downloads for those DM’s like me who are working in the financial red already. Good point about the getting your name out there. I know 3 of my players nave looked you up and enjoy your posts. Hey that is a huge help. Spreading the word and rating/reviewing stuff is free and just as valuable if not more to me! I think that a lot of people do not understand that “Pay What You Want” can be used as a “Try Before You Buy” model, because it isn’t obvious that you can buy something for $0.00 and then go back and buy it again for whatever you would want to pay for it. As well as being good as a “Try Before You Buy” thing, I also think it is a good way to keep gamers who are suffering financial problems in the loop. There is always the risk that some stingy people won’t pay anything anyway, but if a rich GM paid $10 for something and they had eight players who downloaded the same product for free, that would mean that the rich GM could run the game and make sure everyone had access to the documents they wanted everyone to have (without any piracy). Have you considered doing something like Paetron to allow you to finance putting art into your existing PDFs or to allow you to create “Free Gaming Resources” for Eberron and other things? Hey thanks for the heads up! I have thought about Patreon and I’m still playing around with it. I agree with the “try before you buy,” but I’m not sure most people are doing that! I like the “pay what you want” option, as it is a good way to see if what I am getting is any good before I spend any money on it. I have also ventured into putting pdfs up on dmsguild to get my stuff out there. I have a couple up now, and plan on making a few more. For my unknown status when it comes to D&D material production, I am quite pleased with my “success”. 6% is higher than I ever expected. Like you, my layout and formatting abilities aren’t the best, and being unknown, I chose the PWYW direction for my 2 items so far, and will do so for the next 4 I have planned in the same series, and probably for the foreseeable future. Which products are yours? I’d love to check them out. Though a couple of mine will end up competing with your’s, as I plan to make greater and elder versions as well. Though a couple of mine will end up competing with your’s, as I plan to make greater and elder versions of these elementals as well. Nothing wrong with that! Can’t wait to check these out. The PWYW model seems to work and also allows people with no funds to get accesss. That said, why not implement a minimum of 1 dollar for future products? No body can tell me they don’t have 1 Dollar, or even 4.50 (a cup of coffee costs that much in Auckland). Reviews might be essential to get people to see your stuff as high quality, so first having no lower limit is quite a good idea for exposure, but I guess stepping forward a PWYW with a one Dollar minimum might be worth considering. I’m not sure you can apply a minimum to PWYW products on the DMs Guild. That’s a really cool idea. I should see if they have that feature! Do you still need help with visual design? Thanks for the info! I’ve got a few titles up as PWYW and I experimented with making my first two a mandatory $.77 each and they do pretty well either way. I also tried to create a thread between them by writing some short stories to go with a set of my titles. It’s hard to know if it helped or not thought.